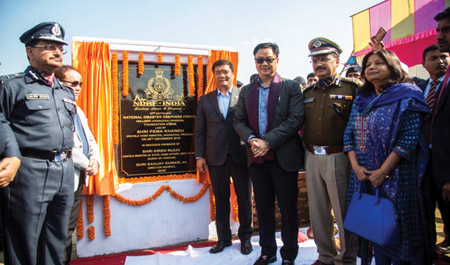 HOLLONGI, Dec 29: Chief Minister Pema Khandu on Saturday laid the foundation stone for the headquarters of the 12th battalion of the National Disaster Response Force (NDRF) here in Papum Pare district. “The permanent stationing of the NDRF in Arunachal will strengthen the fight against natural calamities and manmade disasters in the state,” the chief minister said. “The services of the force could also be availed by neighbouring Assam, if need be,” he added. Describing the day as historic, Pema said establishing the battalion’s headquarters in Arunachal was made possible by Union Home Minister Rajnath Singh and his deputy Kiren Rijiju. He specifically mentioned the role of Rijiju, who brought the project to the state in 2014, but its establishment got delayed due to land issues. The chief minister congratulated Rijiju on being conferred with the ‘Disaster Risk Reduction Champion for the Asia Region’ by the United Nations. Pema also announced that all the projects to be developed by the state government would include environment and safety concerns. “The state government will soon implement the building byelaws in Arunachal,” he said.